There are records we play and play until the sounds that thrill us become an annoyance. We love these records to death, and in two personal instances, that death might have been my own. My friend, the late great Chris Kelly, once threatened me with a flying, full 32 ounce bottle of tonic water when I suggested listening to "Exile On Main Street." He had had enough of the Stones classic by the late 70s, and placed a moratorium on all things "Exile-related" in 1982. I listened to XTC's "Skylarking" on torture-method repeat the week it came out in 1987. My roommate Rich, who rarely if ever bothered me when my door was closed, knocked on my door and in his best Bob Hope asked, "You like this album, don't you?" It was funny, until you saw the look in his eyes. He had had enough of "Skylarking." Then there are those lost vinyl creatures that fail to impress on day one, so they are shoved onto the shelf until something or someone prompts a reevaluation. For me, this applies to Daryl Hall's 1980 piece of genius with the great Robert Fripp, "Sacred Songs." The duo met. They worked together in 1977 and delivered "Sacred Songs." RCA refused to release the album, finding it far less commercial than they believed the growing population of H&O fans were looking for and quickly shelved it...until 1980. 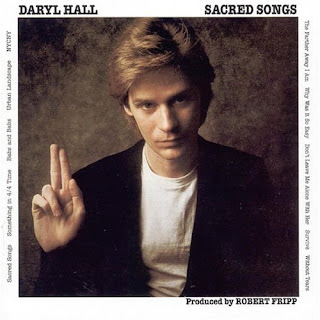 Part of an unofficial Robert Fripp-produced trilogy that also includes Fripp's own "Exposure," which Daryl Hall appears on, and Peter Gabriel's sophomore solo release, "Sacred Songs" is not only the best of the three, it might be Daryl Hall's finest hour. This record was not what I wanted it to be, though it's hard to say all these years later exactly what I was expecting, having been a fan of King Crimson and Hall & Oates. It certainly has elements of both, but it is incredibly unique in that nothing, not even the most commercial tunes, such as the title track and first single, or the gorgeous Philly-soul of "Why Was It So Easy" simply flow from beginning to end. Robert Fripp's use of his then "new" invention Frippertronics works in ways no Hall & Oates fan could have ever imagined for the pop duos own material. "Sacred Songs" has a subtle beauty to it, and when it's ready, can beat you up. I've played this record a lot less than I should have over the last 30 years. It still has that "new car smell," which is a good thing. I pulled it out last night and it may have been a peak listen. One vivid memory I have about listening to "Sacred Songs" back in 1980, was how displeased I was with the sound of the record. It is mastered so low, the bass and drums were just too flat for my tastes. That was not a good thing for a youngster accustomed to cranking out Led Zeppelin records on 10. Subsequent CD reissues sound much better, with a bit more punch, but actually, I listened to the vinyl last night, and it didn't bother me one bit. Daryl, Robert, if you're reading, consider a brief East Coast tour playing both "Sacred Songs" and "Exposure" in their entireties. You'd get me off the couch for that one. Here are a few of my faves, though I do believe the record plays better as a whole. I've also included a live of version of "Why Was It So Easy" from a recent episode of "Live From Daryl's House." It features Butch Walker, who nails it. Yeah. I'm afraid of this album. Maybe I'll listen to it one day. Great post, your love of music shines through -- again. PS: I see you are reading Jim Thompson. I love his writing, and recommend his biography: Savage Art by Robert Polito. Great life story and really insightful about the writing. Okay -- as you were. Very nice write up, Sal. Like you I've had this one in my collection since its first release. It's a very atmospheric album, capable of stirring hard to articulate feelings and emotions - there's an unsettling melancholy to The Farther Away I Am for instance. 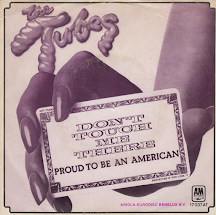 It isn't an album I play very often at all - it's one of those where you more or less just have to look at the sleeve to conjure the gestalt - but I'm glad to know it's there when I need it. One more thing: the Butch Walker/Daryl performance is almost like Daryl duetting with himself, Butch is "doing a Daryl" so much - what a compliment to Daryl Hall to have a younger guy like Butch emulating him so well. Sorry, man, but I got to go with Peter Gabriel's 2nd album as the best in the Fripp trio you presented. Nothing against this Hall solo album -- I've heard it and liked the chances he obviously took at the time. But for me, the second PG album is the one -- it's solid all the way through, directly accessable as a pop album and taking enough risks to put it out on the edge (especially the use of steel guitar on some tracks). I love that album! Much like Queen's Night at the Opera may have had higher creative peaks, I'll still always prefer Day at the Races which, like the second PG album, just holds together better and has much less down time. And the back cover photo of Peter acting like the Hunchback of Notre Dame as he stumbles outside Grand Central Station in the gray slushy snow is a scene I've come to appreciate and emulate more than a few times in my life. I used to hate H&O, but have learned to appreciate Daryl's talent. I, er, acquired "Sacred Songs" and will listen to it someday. I'm a big Kink Rimson fan and "Exposure" has to be the biggest disappoint I ever bought. After that comes Television's "Adventure", The Clashes "Give 'Em Enough Rope", Cheap Trick's "In Color", all of Peter Gabriels albums after Genesis, and all of their albums after he left. I guess PG 2 needs a reevaluation. I always felt like Side One, aside from "Wonderful Day, was perfect and Side Two, aside from "Indigo" was throwaway. Would love to switch those two. As for "Exposure," well I just love it. Really hard to complain about these three records a "project." Just looked up the wikipedia reference on the album and was surprised to find that's Roy Bittan playing piano on many of the tracks (particularly "Mother of Violence" and "Home Sweet Home"). If you read some of the stuff he played on in the 70s (Station to Station! ), he had a pretty impressive track record purely as a sessions player at the time. Although I noticed they missed his integral role on Jackson Browne's Pretender album. Just gave PG II a nice, loud reply. First time in who knows how long. Fun stuff, but my feelings haven't changed. Substitute "Wonderful Day" on Side 1 with "Indigo" and you've got one of the best album sides of the 70s. But those mainstream rockers like "Animal Magic" and"Perspective" leave me cold. Just busted out Sacred Songs with new stylus and cartridge....yowza...terrific album...Exposure: uunnmmm...not so much. But hey that's Fripp alright and some great support on the album....ps like the good old days I already sent the tone arm flying across the turntable platter twice...thus giving said stylus the grinding it didn't need...so it "was" a new stylus, I suppose.....give me digital per favore..